2015 is well and truly underway—and so is a lengthy general election campaign it would seem. With four months still to go until the polls open, the parties are already vying for our votes with claims, counter-claims—and posters. 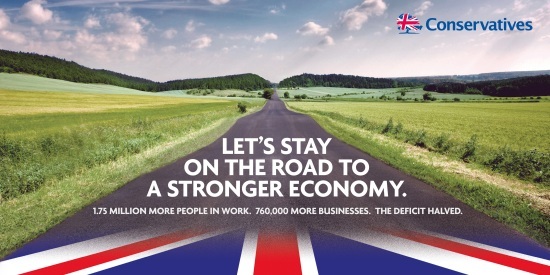 In their first campaign poster of the new year, the Conservatives offer up a vision of verdant fields and a well-maintained road stretching into a sunlit horizon—although according to some sources quite possibly a well-maintained German road. We haven't researched the picture's origin, but we have taken a look at the claims. "1.75 million more people in work"
That's right. Total employment has increased substantially since the election, from about 29 million people in February-April 2010 to around 30.8 million people in August-October 2014. The Conservatives are counting from before the party was actually elected, and the size of the increase depends on the period chosen. About 1.3 million workers in this increase were in full-time employment. But the population has grown too. There were around 1.3 million more people in the UK in midyear 2013 than there were in midyear 2010. The employment rate takes out the effects of changes in the population on employment. This has still increased— about 73% of people aged between 16 and 64 were employed in July-September 2014—up from around 70% at the election. However, this should be viewed in context: the employment rate would be expected to rise after a recession. That's right too. The government have used the Business Population Estimates produced by the Department for Business, Innovation and Skills, which show that from the start of 2010 to the start of 2014, the number of private sector businesses in the UK increased by 760,000. But the BIS figures include a 707,000 increase in businesses that have no employees—mainly self-employed workers. The difference between the deficit and government debt can be confusing. While the debt is the amount of government borrowing that has not yet been paid off, the deficit is the difference between government income and spending within a year. 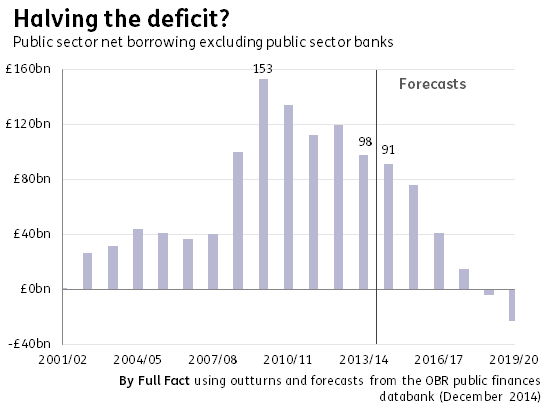 While the deficit has been cut substantially, it's not been halved in absolute terms. 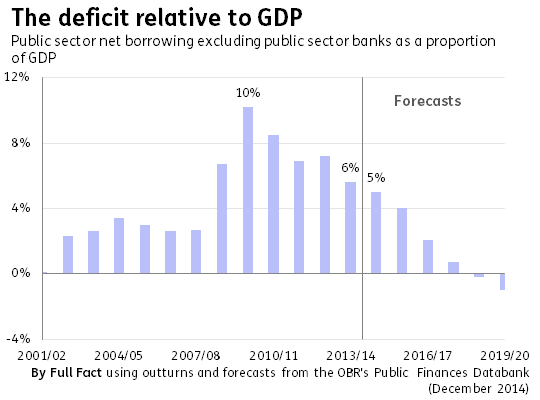 Instead of talking in absolute terms, the Conservatives are discussing the budget deficit as a proportion of GDP. By this measure, the deficit has halved. In absolute terms, it's been cut by about a third. When we talk about the deficit it's important that we know which measure is being referred to. While the ratio of the deficit to GDP is useful in predicting the effect of the deficit on the economy or how affordable government borrowing is, the headline measure of the deficit is its absolute value. 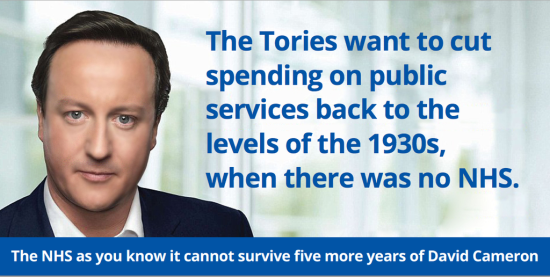 Labour has adapted a previous Conservative campaign poster to attack their opponents, claiming they would cut spending on public services to the levels of the 1930s. The Conservatives don't plan to cut public spending to the level of the 1930s—at least not in absolute terms. 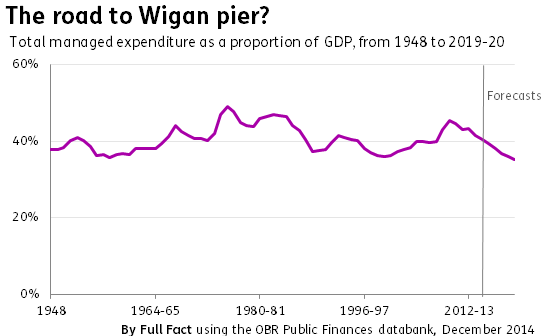 Labour is using a figure for spending as a proportion of GDP to make this point. The party press office confirmed this and source the Office for Budgetary Responsibility report on the Autumn Statement. In absolute terms, planned spending by the Conservatives would still be higher than in 2007-08. 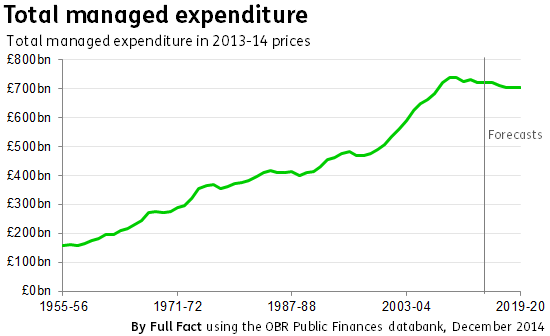 The OBR data only goes back to 1948 for total government spending as a proportion of GDP, and to 1955-56 in real terms. However, IFS analysis of historical General Government Expenditure (a narrower definition) indicates that under Conservative plans spending as a proportion of GDP would be at it's lowest level since the 1930s. Will you pay an extra £3,000 for a Labour government? Are people £1,600 worse off since the last election? Factcheck: Did Ofcom say the Greens can't take part in leaders' TV debates? Factcheck: Are only one in 40 jobs added since the recession full-time? Middle-class problems: are we either stuck in low paid jobs or earning less in the middle? Middle-class problems: are there fewer jobs now for those in the middle? Is there a plan to cut care at A&E departments? Is David Cameron exaggerating female employment figures? Have a million private sector jobs been created since the election? Did female unemployment rise under Labour?